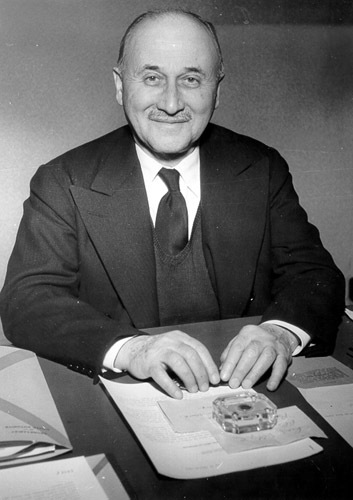 Jean Monnet (1888 – 1979), a French political economist and diplomat, is regarded by many as a chief architect of European unity and one of the founding fathers of the European Union. The European Union itself maintains his memory with the Jean Monnet Programme of the Directorate-General for Education and Culture, which promotes knowledge of European integration on a worldwide scale, especially at the university level. The Jean Monnet Programme intends primarily to stimulate teaching, research and reflection on European integration. It was launched in 1989 and since 2007 it has formed part of the Lifelong Learning Programme 2007-2013. Visit this website for more information on the Jean Monnet Programme. To support the work of professors and researchers specialising in European integration, the Jean Monnet Programme funds the following actions: Jean Monnet Chair, “Ad personam” Jean Monnet Chair, Jean Monnet Centre of Excellence, European Module, Association of professors and researchers, information and research activities, Jean Monnet multilateral research groups. Jean Monnet Chairs are teaching posts with a specialisation in European integration studies. They are awarded by the European Commission to academic teachers selected on the basis of their academic merits and following a process of rigorous and independent peer review. They are a recognition of the holder attaining a standard which is commensurate with a senior professional level of achievement in European integration studies. Since 1990 the University of Portsmouth has been a member of an exclusive elite network of European integration studies. The University of Portsmouth has been associated with the Jean Monnet Programme since 1992. Dr Anna Syngellakis, Jean Monnet Chair 1990-2012, was heavily involved in developing the European Studies degrees offered by the University at undergraduate and postgraduate level. From a single module offered in the early 1990s, UoP has now a number of thriving undergrad and postgrad degree courses in European Studies. In June 2013, the University of Portsmouth was one of only 17 institutions worldwide to have been recognised as a Jean Monnet Centre of Excellence. To date there are only 170 designated Jean Monnet centres throughout the world so this is a considerable achievement for the University. UoP also has a vibrant European Studies research community. Visit the Centre for European and International Studies Research (CEISR) website. UoP graduates and postgraduates in European Studies have progressed to careers in the UK civil service, in universities, in EU institutions and in a variety of other sectors, such as banking and finance, teaching or the voluntary sector. For more information, see the Employability page. In January 2010, Professor Mike Mannin (Jean Monnet Chair) joined the University of Portsmouth from Liverpool John Moores University. Since April 2012, Dr Karen Heard-Lauréote holds the University’s Jean Monnet Chair, following the retirement of Dr Anna Syngellakis. Also in April 2012, Dr Heard-Laureote was awarded approximately 34 000 euros of joint funding from the European Commission to fund the development of a simulation and negotiation teaching unit at post-graduate and under-graduate level: Policy and networks: The Governance of the EU. In June 2013, the University of Portsmouth was recognised as a Jean Monnet Centre of Excellence.